When Laurier's Liberal government was elected in 1896, a westerner, Clifford Sifton, was named Minister of the Interior. 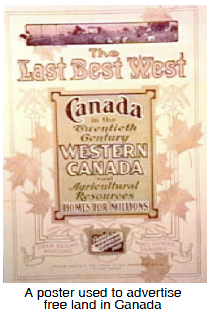 Under Sifton, a major campaign was launched to encourage immigrants from Europe and the United States to come to Canada. Sifton wanted primarily skilled farmers to help develop the rich, but under-populated prairie provinces. He advertised, set up display booths at world exhibitions and gave foreign journalists free trips to Canada. It was a good time to attract immigrants. The country was coming out of a 25-year recession, the price of wheat on foreign markets was increasing, and the price of labour-saving farm machinery was going down. Still, conditions were hard. The land, though free, was tough to clear and cultivate, the growing season was short, and the vast distances between farms contributed to great loneliness. Sometimes the Canadian government wasn't altogether aboveboard: without tricks or concealment.aboveboard in promoting immigration. Shipping agents like the North Atlantic Trading Company were paid large bonuses to direct the best agricultural immigrants to Canada. 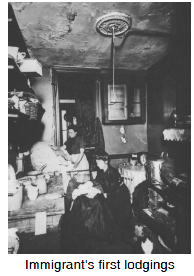 An expanding industrial sector was also in need of low cost labour for its factories and mines although Canadian workers and a budding labour movement opposed the importation of cheap, easily exploitable workers. 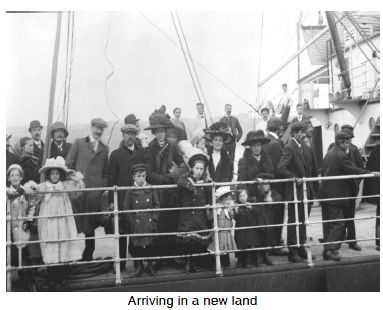 Between 1897 and 1914 over 3 million immigrants came to Canada from Great Britain, Poland, Russia, the Ukraine, Germany, Italy, China, Japan, Finland, Sweden, Hungary and the Slavic countries. The population of the country increased by 40 percent. Many people opposed the Sifton and Laurier immigration campaign feeling that their jobs were being taken away and their way of life was threatened by all these newcomers with their foreign ways. People were particularly fearful of Oriental immigration. 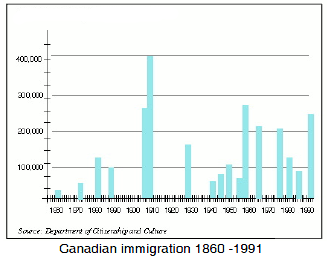 By 1900, 11 percent of B.C. 's population was Asian. However, many attempts to impose head taxes failed to discourage the hard-working Chinese who were prized by businessmen and industrialists. 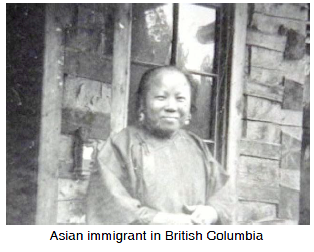 When recession hit the country in 1907, the backlash worsened and there were several violent incidents against the Chinese, Japanese and East Indian populations in Vancouver.